Spray large nonstick skillet with nonstick cooking spray. Heat over medium heat until hot. Add breakfast patties; cook 6 to 8 minutes or until lightly browned, turning once. Add all remaining ingredients. Reduce heat; cover and cook 8 to 10 minutes or until vegetables are crisp-tender, stirring occasionally. 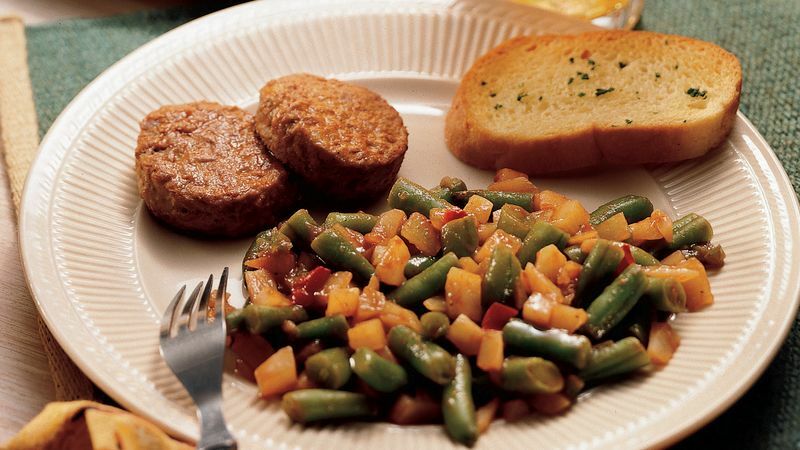 Sausage patties made with soy protein offer a lower-fat alternative to pork sausage. Sliced fresh pears and toasted garlic bread are quick complements to this entrée. Frozen foods should be stored at 0°F. or slightly lower. Keep a freezer thermometer in the freezer to ensure the correct temperature. To prevent freezer burn and deterioration, wrap foods tightly and remove as much air as possible from packaging such as plastic freezer bags.